The OBA went to great lengths to speak on the unemployment rate of Bermudian young adults. On February 13, 2013, Minister Michael Fahy introduced a draft policy to allow the children of nonBermudian guest workers the ability to seek summer employment in Bermuda. 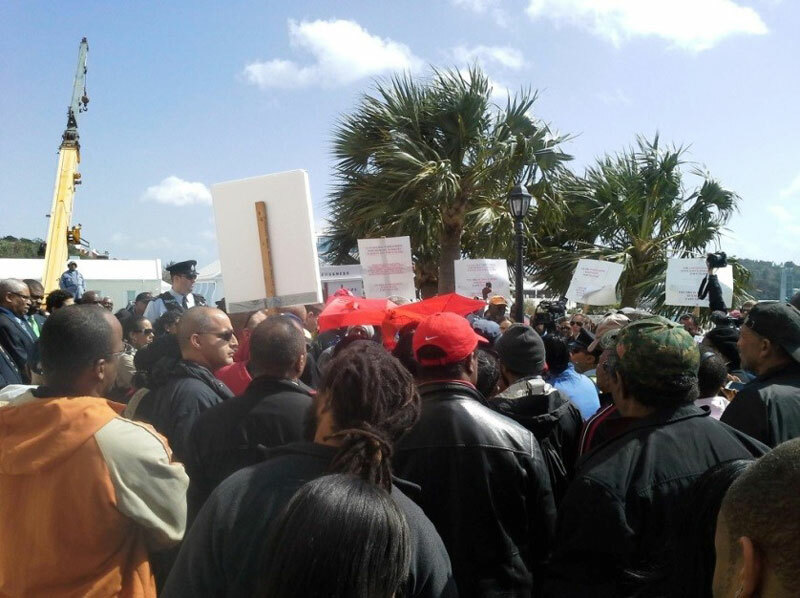 This, along with issues of OBA officials labelling Bermudians as Xenophobic, caused a massive turnout at Cabinet. “The Ministry accepts the views that the perceived impact that this change in policy might have is the reduction of available job opportunities for Bermuda’s youth at a time when summer employment is scarce. “As a result, the Ministry is content that the other significant proposed policy amendments may be sufficient to address stakeholder concerns with respect to the more pertinent business development and job retention issues facing our economy. Most Bermudians naïvely believed that this issue was a dead issue. On Monday, March 2, 2015, it was revealed by radio host Sherri Simmons that the following policy was now in effect. A sponsored dependant is a partner or child of a work permit holder. For the purpose of this section, children under 18 years of age are classified as dependants of their parents. In cases where the children are attending a college or university, the children continue to be classified as dependants up to the age of 25 years. Essentially, Minister Fahy had revised and reworded his earlier plans to allow the children of guest workers to seek employment in Bermuda. Additionally, the age limit was amended from 19 to 25. On Monday March 2nd, Junior Home Affairs Minister Sylvan Richards JP MP defended the policy in the House of Assembly. He was not alone. Minister Patricia Gordon-Pamplin defended the policy as well. Not one of them stood up to defend Bermudian children. Not one. There is clearly a pattern established showing the continued intent of the OBA to give children of guest workers the ability to seek employment in Bermuda. Seemingly, every two years they have to face the OBA Government of Bermuda putting the children of guest workers ahead of them in their own country. How does any such policy help Bermudian children exactly? Quite simply, it does not. Column: How Is Policy Working For Bermudians? Ahead of them? Or do you mean no longer decidedly behind them? As in ‘No work for you Chip – better stay inside unless you’re going out to spend Dads money’. No – can’t agree with that Chris. This isn’t the big issue. PLP – UBP -OBA/UBP – all of us P (people) have so comprehensively screwed things up for our next generation of offspring that this is really a non issue. What are we talking about 10 or maybe 20 that would actually take advantage of this? If that helps convince Dad to stick around for a little while longer instead of moving the whole family back home then the benefit will outweigh the cost. It’s almost over anyway – soon arguing over things like this will seem like the most ridiculous thing imaginable. The thing is, the minister has already clarified that dependant children are not allowed to seek employment. While the dependant term is defined as being spouse or child of, when it comes to the dependant who is able to seek employment, it only applies to spouses, and even then they will have to get a work permit. The work permits only apply to the individual who holds it and no one else, meaning that while they can bring their spouse and children, unless their spouse, and only their spouse, gets their own work permit, they cannot and never could work under the primary’s work permit. go to the top of the lighthouse any you will see that we have not used our land wisely. Why did the “H” city get a 5 story planning limit ? Could it be a lack of Vision ? ” putty and paint to hide many a complaint” ! TCF, why can’t you question your own PLP? Oh yeah it’s because you had hoped it all going to work out with them. great work Chris, now I see why you are so famous.. undisputable facts delivered again! Unfortunately as radio host always says —-When someone shows you who they are, believe them! !And no one will take care of you better than you! The Oba and others have shown us that we are not in the forefront of any decisions made even though we the electorate put them in positions and not the permanent workers or the ex-pats.. as a matter of fact they take more money out of the island a year than some budgets cost but no one wants to address that particular subject …there will be all sorts of justification from all kinds of people.. but the problem is in our face! because it’s their money and their allowed to do with it as they please you dummy! Be real do you want to be a pot washer or work at buzz or be a cleaner etc because that is the majority of what expats do besides the ones in IB. GET REAL, bermudians couldn’t be bothered to get down and dirty, it comes down to not wanting to get paid low wages for a BS job. BERMUDIANS WOULDN’T DO THESE JOBS ANYWAYS EVEN IF THEY WERE OPEN!! GET REAL!! Chris should be thankful that there are jobs for anyone, let alone complain that non Bermudians might take certain jobs. If I was the OBA I would hold my hands up and be truthful and say the financial situation is irreversible and terminal. The PLP condemned Bermuda to oblivion. There is no way out. Chris, Bermuda is no more, it is bankrupt thanks to the PLP spending the unexpected extra revenue that was budgeted around 2006 – 2009, then borrowed more. That was the period of maximum revenue and it will never return. As usual.. thank you for taking the time to read. As usuaal…can anyone point out if the facts presented are untruthful? Care to actually speak on the topic of the OBA attempting time and time again to give children of guest workers the ability to work? What about the following part of the section on sponsored dependents : ” For avoidance of doubt, sponsored dependent children are only given permission to reside, not seek employment”. What do you think that means, Chris? Did you read the time line? Please provide the specifics of the defences you allude to. Were they specifically defending the ability of children of guest workers to seek summer employment? Or were they defending the legislation in general, which as written needed clarifying? Which is what the minister did, as opposed to a 180 degree turn as you have deduced. If I can offer some insight, this addition was requested because the former wording reduced the amount of youth (and adult to be fair) volunteer work as they “required” a work permit to even volunteer. Reduction in this volunteer population has hurt many charities. All summer jobs work the same as any other job. Whilst the work permit is not needed, a bermudian still has to be considered first. It is largely self-governing but if you know of any deviations from the status quo, please inform your nearest representative that you trust. That’s pretty interesting information there. Thanks for sharing that. Why doesn’t the term “Chronological order” work for the PAC? Lots of stuff they have been highlighting about the AC. Still no public meetings on Port Royal or a slew of other topics you will no doubt avoid commenting on. “For avoidance of doubt, sponsored dependent children are only given permission to reside, not seek employment”. What is the point of your article? The point as defined by the headline is to show a continued attempt to give children of guest workers the right to seek employment in Bermuda. So your point is that despite the government being in power for over two years and children of guest workers still don’t have the right to seek employment, the government still “wants” to do…. so they are untrustworthy. Well if they wanted to do so why haven’t they? There has already been a march of thousands in respect to furlough days – even if the same is repeated so what? You say Fahy is such a bad guy… well he wont care right? He was not even voted in he is doing this for himself correct? So he would just do it wouldn’t he? Obviously if he wasn’t “caught out” he would be once the policy is released and enforced and then the issue would be raised anyway so you make no sense. What happened here is that the position was clarified and it went against your conspiracy theory so what is a political commentator to do? I guess with you its clear…..you write about it anyway. Your goal, as it always is, is simply to enflame. You should do better, and Bermuda deserves better. To be fair your are not the only one, but you do have the most articles published which simply set out a narrative in respect of “possibility” that you know will get your base riled up. Rather than presenting the fact that what you are suggesting is not true. Take the numbers of those granted status as another example. whoops CF got burnt lmfao…no response after the facts were proven, typical! Mr Famous please can you address BT Checker’s points above? I want to hear what you have to say in response to this. In particular, what is your response to the points in respect of your political narrative and (seeming) contradiction of what you are saying. We have met and I think you are a good person but you should address the allegations BT Checker sets out as it fits what many I talk to say about you – here is your chance to address it. If you don’t it will be hard to take your articles seriously. I hear crickets chirping. And that’s all we will hear when this guy is pressed for actual facts. Same sh-t, different day. YAWN. Who cares? You and the PLP are pettifogging the issues like you always do! Why shouldn’t children of guest workers be allowed to seek employment? If there is a better suited Bermudian candidate then the Bermudian will get the job. Why are Bermudians so afraid of competition? We have bigger problems here which you and the PLP refuse to acknowledge. We are in the red zone. We need desperate measures unless you want to end up like Jamaica and Bahamas. And the Caicos et al. And it’s always the ones with great gig houses and cars and fancy clothes and boats. Your article criticizes a policy that doesn’t actually exist. Inappropiate context, exaggeration, misdirection inflammation, ignorance. Well I for one don’t bother to read your gibberish, I prefer to read the comments they’re much more factual and entertaining. No where does it say that any dependant can work without having to get a permit themselves. So irregardless of whether it is the spouse or child, while they could seek employment, unless they get a permit to do so, they cannot work. So there is very little change from the current environment for Bermudians applying for jobs. Chris…This pitting of people against people – all of whom live in Bermuda is unconscionable. why does everyone pre-suppose that the dependent children of work-permit holders will be given the summer jobs over bermudian kids? they are being allowed to apply for the jobs but it is up to the employer as to who actually gets the jobs! it seems to me that if the bermudian kids are the best fit for the jobs, they will get them. right? so then who cares if children of work-permit holders can apply also? Thats naive, completely ignoring the dynamic of preferential treatment (i.e. on the basis of skin color, accent, connection/class etc etc etc…). Presuming this does not exist suggests you do not live in or know life in Bermuda. And you’re completely ignoring the fact that this whole article was written based on a policy that doesn’t actually exist. Could you imagine President Obama attempting this in America , or the Canadian Prime Minister attempting to back door egregious legislation such as this ? but wait…your comparing us to a couple of the worlds most successful countries,we have been told in the past that’s just not allowed! There is no “backdoor legislation”. Another PLP myth. happens ALL the time in America mate! so much pork in those bills it ain’t funny. Prssident obama just gave 5mn ILLEGAL immigrants amnesty. Thanks for your piece. I don’t think children of guest workers getting a summer job here is a major issue, as somebody pointed out, if it keeps C-level executives on island with their family then it actually provides more benefit than cost. 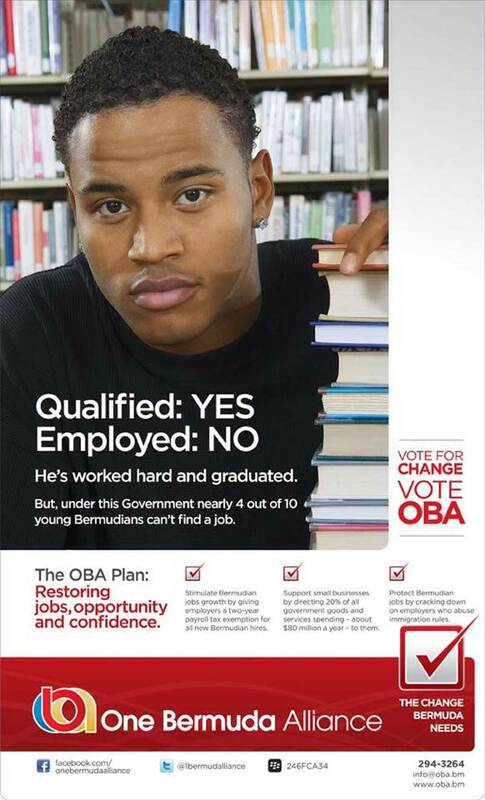 It is a bit disingenuous though, you are right, of the OBA to run such an ad and then put in place policies that could run counter to creating job opportunities for Bermuda youths. Let’s remember that this sort of thing isn’t partial to just the OBA though; the PLP are pretty good at it as well (as are every political party around the world – sadly it is politics as usual in many senses). Just because you are given the opportunity to apply, doesn’t mean that you’re automatically going to be given that which you apply for. And before you get into ‘preferential treatment’, I want you to actually imagine employers going through the applicants, reading ‘Bermudian’ and automatically tossing them in the bin. Yes, there are idiots who run businesses, but not as many as you like to imagine. It’s more likely that applications are sorted with Bermudians on the top, simply because it’s a much easier process to hire them. Also… if you look for the worst in people, you’re going to find it, but in your one sided focus, you’re going to miss all the good that is out there. As a Bermudian and a father, I don’t see anything wrong with competition for kids. We have to learn to compete and if we see another kid getting chosen because of working harder, applying better or being interviewed better well thats a life lesson. We do it in sports and we should do it with summer jobs too – protecting our kids is one thing, failing to prepare them for the real world is another. the time line clearly lays out two time periods that the same policy was introduced. Why did the OBA back track on their policy in 2013? Why did they back track on their policy in 2015? Feel free to listen to the audio of MPs Pamplin and Richards defending the policy to allow children of guest workers to seek employment. parliament.bm is where you may find it. And how many times did the PLP backtrack. Last time…no backtrack existed…except in the way you chose to portray it. CF: Above you said “the OBA Government of Bermuda putting the children of guest workers ahead of them in their own country”. This is an outright lie and you know it. Even if a foreign child was allowed to apply for a job, he/she would still have to get a work permit. This is NOT putting foreigners ahead of Bermudians. If you want to retain a shred of respect from people – you should report the truth. In thsi case you did not. I am very disappointed in you CF. I might disagree with you, but I thought you at least spoke the truth. Can’t wait to see your next edition. They will be happy that Bermudians continue to enter Britain as economic refugees while this government’s minister of foreign employment procurement continues to open the door wide for foreign workers to find full employment in Bermuda; that indeed is Bermuda’s greatest irony or from the perspective of the Bermudian; it’s greatest disappointment. Hard to tell which party your referring to there Alvin. But i suspect fewer ‘refugees’ are leaving under this one. Perhaps you have some actual facts to tell us instead of your usual gum flapping. The only dollar Bermuda ever makes, is one where somebody foreign sends it or comes here and spends it. Please read this as often as it takes to sink in. Bermuda generates no dollars itself (not one single dollar). Thsi is the secret PLP does not want you to know. If all foreigners left, our internal money would become worthless and we’d all become fishermen. We would starve. Be thankful that people come here. Bullhockey Alvin and you know it and your spreading garbage. In Bermuda most work. Nothing is free. Economic refugees. Very apt description. They didn’t get that way in the past two years.